It is BOOK BOMB time! 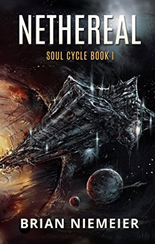 Today’s pick is Nethereal by Brian Niemeier. I read this a couple of months ago and the best way to describe it is Space Pirates Go To Hell, only it is way cooler than that description makes it sound. For those of you new to Book Bombs, the goal is to get as many people as possible to buy an author’s book on the same day. The more books sell, the higher it gets in the rankings, the more new people see it. If it is something that you would be interested in reading anyway, getting it the same time as a bunch of other folks pushes it up in the ratings, which means more publicity, exposure, and new fans. Success breeds success, and a good Book Bomb can get an author hundreds of new fans. We steer people toward Amazon for this because it is big, has lots of eyes on it, and has an constantly updating sales rank, but if you prefer to purchase somewhere else go for it, because the most important thing is that the author GETS PAID. So please spread the word and tell your friends. Brian is a relatively new writer, so let’s give his career a boost. Thanks Larry, and thanks to the Monster Hunter Nation. You guys have always made me feel welcome in the comments. I’m especially grateful for your hospitality today. I first came to this blog as a reader, like all of you. I wanted the fun, exciting stories that seem to be in short supply these days. Larry stands among a new generation of authors who write for a vastly underserved audience. These writers know that the reader is king. They put entertainment first. By their example–and with guidance from stellar authors like John C. Wright and Jeff Duntemann, and my awesome editors L. Jagi Lamplighter and Jason Rennie–I learned that I work for you, the readers. How’s it working out? My first anniversary as a pro novelist is next month, and for my performance review, my bosses nominated me for a Campbell Award. You did that. Words are the tools of my trade, but I can’t find any that fully express my gratitude. So I’ll just say thanks and point you toward my first book, Nethereal. It’s been described as what you’d get if A. Merritt wrote a Dune novel after binge-watching 90s anime. Nevertheless, people dig it. Already read Nethereal? I haven’t forgotten about you. The thrilling and even better-received sequel, Souldancer, is available now. And in honor of the occasion, it’s on sale. Thanks again to my esteemed host the International Lord of Hate, and to the readers who support us authors. Buy my books so I can GET PAID and bring you more stories about space pirates in space hell. A woman like no other who longs for acceptance. A precision killer inspired by the dream of his captain. The last member of a murdered race, fighting to avenge his people against the might of the Guild…and the dark powers behind it. The Sublime Brotherhood of Steersmen holds the Middle Stratum in its iron grip. Jaren Peregrine, last of the Gen, raids across fringe space with Nakvin—her captain’s best pilot and only friend, apprentice steersman Deim, and mercenary Teg Cross. Hunted by the ruthless Master Malachi, Jaren and his crew join a conspiracy to break the Guild’s monopoly with an experimental ship. But when its maiden voyage goes awry, the Exodus flies farther off course than its crew could have imagined. This entry was posted in Announcements and tagged book bomb, Brian Niemeier, Larry Correia, Nethereal, Souldancer by Ben Zwycky. Bookmark the permalink.